I wrote a 1 page 'orientation' on techniques using the vacuum sealer a couple of weeks ago to accompany a recipe booklet for the tasting menu items. This is a new area to most cooks, and I wanted to break it down simply on paper as an addition to actual hands-on training. The need was realized as I was documenting the recipes from scraps of paper penned a la minute, and noticed that we actually have 5 different (or slightly different) applications using the machine on that one menu. I am not referring to ROP (reduced oxygen packaging) storage or cooking of foods that is so under fire lately from Health Departments all over the USA (but not so bad as in New York where so called 'health' vigilantes forced chefs all over the city to trash thousands of dollars or sous-vide packed food and declared their machines illegal). I am referring to the many other uses of the vacuum machine. A good cryovac can do most of the things a gastrovac can, but with the added benefit of compression. I'd like to discuss the various techniques. There was a very recent post on Ideas in Food relating to the same subject. We have used the vacuum sealer in the past (as I'm sure most chefs have) of bagging meats with a little of their accompanying marinades to let them sit and absorb the goodness. Through doing this, it is noticeable that magic happens when the bag is made void of air and seals. All liquids inside the bag start to bubble up ferociously like a boil without heat and acts as a forced osmosis for flavors to permeate deep into the cell walls of the meat being marinated. It's much difference that letting meat sit in marinade at normal air pressure. This was the seed, then came the water and fertilizer that was the Star Chefs ICC event in New York which revealed the obvious. We know the process happens, so why don't we utilize it as much as we can. There is a liberation about being able to 'cook' or transform foods without heat like the tomato in the Ideas in Food post. Some foods taste better raw or just ripened or transformed in texture or flavor. I think almost all of the applications we are doing fall under compression or infusion or a combination or succession of the two. There is also the use of creating essences which are similar to infusions. Compression must be done with the aid of the plastic bag. The amount of compression or force is adjusted by setting the millibars on your machine. Simply place produce inside the bag (we are doing this with watermelon and eggplant) and put it in the cryovac. The bag puffs up, then shrinks down into forceful compression. The hard plant cell walls are then crushed together as all air is removed from the interior of the food. What you are left with afterwards is noticeably smaller and different in appearance and color. With the watermelon or similar fruit or vegetable, you get a texture that slices super cleanly and tastes brighter and sweeter due to compression. The color becomes much more vibrant. With a softer flesh like that of the eggplant, you get a more meaty texture that can then hold up to more rigorous cooking methods (see the eggplant post). Sure it is arguable that this is still ROP product, but it does not have to be intended for storage or cooking. The product can be removed from the bag immediately afterwards and the result is still achieved. Let the oxygen flow! Infusion is the process of forcing flavored liquids into a food product. This happens during the vacuum process when the liquids begin to 'boil,' and then also during the compression stage when the liquid is forced into the micro structure of the food. Instant flavoring, brining, marinating... instant. We are doing this mainly with an apple slice that is flavored with licorice, then griddled to accompany a piece of salmon. We make a solution of apple juice mixed with lemon juice and flavored with licorice. Slice your apples into whatever shape desired and drop them into the liquid to prevent browning. Put each slice into its own vacuum bag with a teaspoon or so of the solution, and whammy... into the cryovac. Instantly infused apple. The process works even better in this case if the apple is left to sit overnight. 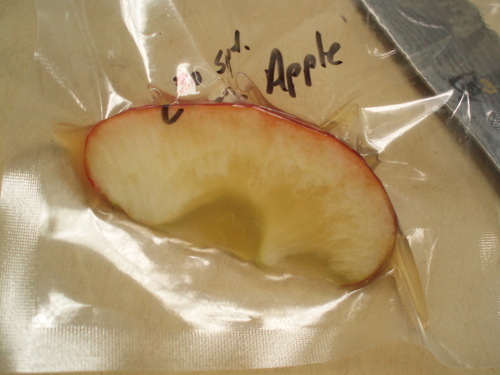 The sugars in the solution slowly transform the apple texture. By adding the lemon juice, the pH is lowered to a point acceptable for ROP foods. Essences like infusions in reverse. Instead of using vacuum pressure to flavor a solid food, we are using it to flavor a liquid with a food. In my simplest example we put dried wild mushrooms in a high walled container with 1 or 2 fingers of water and a pinch of sea salt. 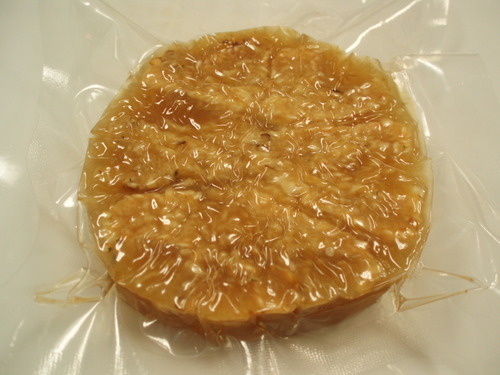 Place the container uncovered into the vacuum sealer and go through the vacuum process 4 or 5 times. You will end up with a very flavorful essence of mushroom in a couple of minutes whereas before it would have taken hours and possibly even subjection to volatile aroma killing heat. Since dried mushrooms are super packed with umami flavor, this essence can be quite useful. Currently, we are adding a small amount of it to each of our compressed eggplant steaks. This is a combination compression/infusion process. The eggplant then tastes and feels more meaty... which is what all vegetarians really want anyway. So after all of this realization, why are cryovac machines being declared illegal? There is so much more they can do for food besides just providing a storage vessel for it. Can't it be like P2P software or Panasonic cassette recorders back in the day? Sure, they can be used for the unauthorized recording of copywrited material, but that is the fault of the user and not the machine.